When you're creating a presentation, you can add speaker notes to refer to later while delivering the slide show in front of an audience. During your presentation, the speaker notes are visible on your monitor, but aren't visible to the audience. So the Notes pane is the place to store talking points that you want to mention when you give your presentation. The Notes pane is a box that appears below each slide. (It is outlined in magenta in the picture below.) An empty Notes pane will prompt you with text that says, Click to add notes. Type your speaker notes there. 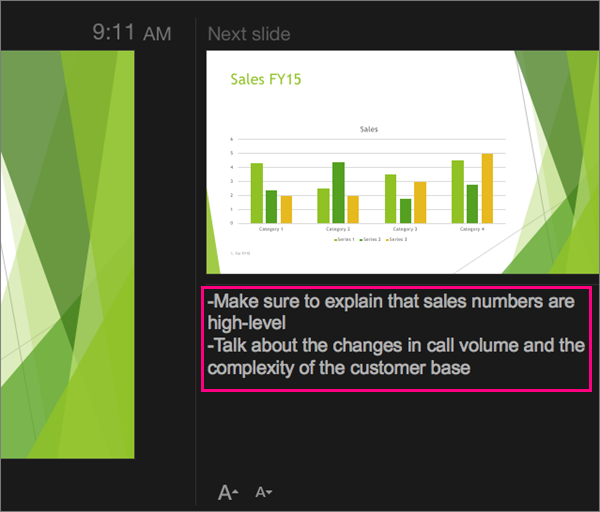 If you don’t see the Notes pane or it is completely minimized, click Notes on the task bar across the bottom of the PowerPoint window (also marked in magenta in the picture below). If your notes exceed the allotted length of the Notes pane, a vertical scroll bar appears on the side of the pane. You can also enlarge the Notes pane by pointing your mouse at the top line of the pane and then dragging upward after the pointer turns into a double-headed arrow. Presenter view isn't something you have to create. 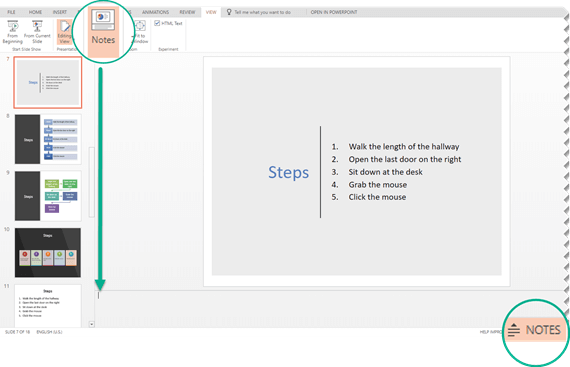 PowerPoint assembles it for you by gathering the notes you've typed for each slide and pairing them with a set of controls for navigating through your presentation. Read Start the presentation and see your notes in Presenter view for more details about how to see and use Presenter view. 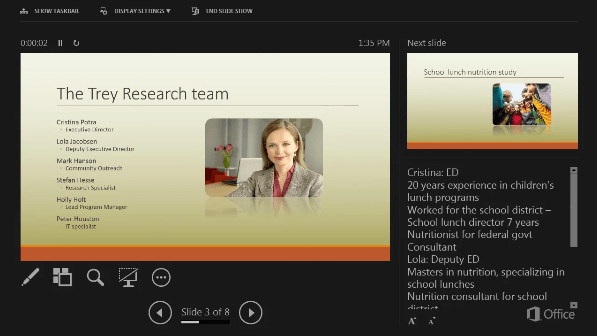 See Print slides with or without speaker notes. Select the thumbnail of the slide you want to add notes to. The notes pane will appear beneath your slide. Click where it says Click to add notes and type whatever notes you'd like to add. To hide the notes pane, click the Notes button on the task bar. To show the notes pane again, click it again. On the View menu, click Presenter View. You'll see the main slide that you're presenting, a preview of the next slide, and any notes you've added for the current slide below the preview of the next slide. Your audience will only the slides that you're presenting in your presentation, and not your notes. 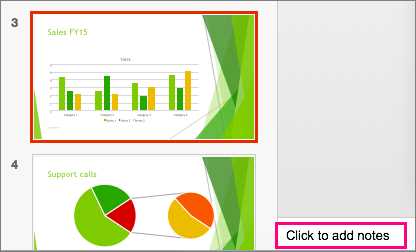 In normal view, you can add notes directly under the slide as you create your presentation. In the navigation pane, click the slide you want to add notes to. Click in the notes pane located below the slide, and then type your note for the current slide. If you don't see the notes pane, drag the bar that is located below the slide. You can apply text formatting such as bold, italic, and underline to the notes. Text formatting is visible in presenter view and notes page view. 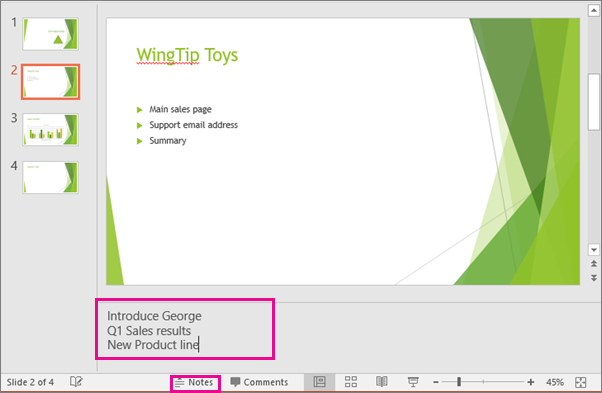 In presenter view, any speaker notes that you made for a slide when you created the presentation appear on the left side of the notes pane. You can also type meeting notes while you present. Click inside the notes pane on the right, and then type your notes. Note: When you exit presenter view, the meeting notes appear below the speaker notes for that slide. You can change the text or format a note while you create a slide or before you print handouts that contain both slides and notes. You can apply text formatting such as bold, italic, and underline to the notes. Text formatting is visible in presenter view and notes page view. In the navigation pane, click the slide that you want to add notes to. On the View menu, click Notes Page. Click in the notes pane, and then type your changes. Select part or all of the text in the notes pane, and then make the formatting changes that you want. Text formatting such as bold, italic, underline, and bulleted lists appears under notes in both presenter view and normal view. Font formatting such as font size, font type, and font color only appears under notes in presenter view. Some changes that you can make in notes page view—for example, WordArt or images—are included in printed handouts but do not appear in normal view or presenter view. PowerPoint Online doesn't have the ability to show you speaker notes while you're presenting your slide show. On the View tab of the ribbon, in the Show group, select Notes . The pane appears across the bottom portion of the PowerPoint window, with the cursor blinking, ready for you to begin typing. The Notes pane can be resized if the content in it can't all be seen at once. When you point at the top border of the pane, the mouse pointer becomes a two-headed arrow . Click the border, and drag up or down to resize the pane. If you're an Office 365 business subscriber and your presentation is stored on OneDrive for Business or SharePoint Online, you can print your speaker notes. See Print your PowerPoint slides, handouts, or notes for more information. 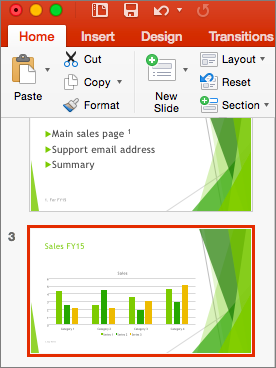 Currently you must use a desktop version of PowerPoint to see speaker notes while you're presenting.